This article is about the brand of dessert products. For gelatin desserts in general, see gelatin dessert. For other uses, see Jello (disambiguation). Le Roy, New York, U.S.
Jell-O is a registered trademark of Kraft Foods for varieties of gelatin desserts (fruit-flavored gels), puddings, and no-bake cream pies. The original Jell-O gelatin dessert (jello) is the signature of the brand. The original gelatin dessert began in Le Roy, New York, in 1897 after Pearle Bixby Wait and wife May trademarked the name for a product made from strawberry, raspberry, orange, or lemon flavoring added to sugar and granulated gelatin, which had just been patented in 1845 in its powdered form for the masses. The dessert was especially popular in the 1930s and 1950s. Jell-O is sold prepared (ready-to-eat), or in powder form, and is available in various colors and flavors. The powder contains powdered gelatin and flavorings, including sugar or artificial sweeteners. It is dissolved in hot water, then chilled and allowed to set. Fruit, vegetables, and whipped cream can be added to make elaborate snacks that can be molded into shapes. Jell-O must be put in a refrigerator until served, and once set, it can be eaten. Gelatin, a protein produced from collagen extracted from boiled bones, connective tissues, and other animal products, has been a component of food, particularly desserts, since the 15th century. Gelatin was popularized in New York in the Victorian era with spectacular and complex jelly moulds. Gelatin was sold in sheets and had to be purified, which was time-consuming. Gelatin desserts were the province of royalty and the relatively well-to-do. In 1845, a patent for powdered gelatin was obtained by industrialist Peter Cooper, who built the first American steam-powered locomotive, the Tom Thumb. This powdered gelatin was easy to manufacture and easier to use in cooking. In 1897, in LeRoy, New York, carpenter and cough syrup manufacturer Pearle Bixby Wait trademarked a gelatin dessert called Jell-O. His wife May and he added strawberry, raspberry, orange, and lemon flavoring to granulated gelatin and sugar. In 1899, Jell-O was sold to Orator Francis Woodward (1856–1906), whose Genesee Pure Food Company produced the successful Grain-O health drink. Part of the legal agreement between Woodward and Wait dealt with the similar Jell-O name. Various elements were key to Jell-O becoming a mainstream product: new technologies, such as refrigeration, powdered gelatin and machine packaging, home economics classes, and the company's marketing. Initially Woodward struggled to sell the powdered product. Beginning in 1902, to raise awareness, Woodward's Genesee Pure Food Company placed advertisements in the Ladies' Home Journal proclaiming Jell-O to be "America's Most Famous Dessert." Jell-O was a minor success until 1904, when Genesee Pure Food Company sent armies of salesmen into the field to distribute free Jell-O cookbooks, a pioneering marketing tactic. Within a decade, three new flavors, chocolate (discontinued in 1927), cherry, and peach, were added, and the brand was launched in Canada. Celebrity testimonials and recipes appeared in advertisements featuring actress Ethel Barrymore and opera singer Ernestine Schumann-Heink. Some Jell-O illustrated advertisements were painted by Maxfield Parrish. In 1923, the newly rechristened Jell-O Company launched D-Zerta, an artificially sweetened version of Jell-O. Two years later, Postum and Genesee merged, and in 1927 Postum acquired Clarence Birdseye's frozen foods company to form the General Foods Corporation. By 1930, there appeared a vogue in American cuisine for congealed salads, and the company introduced lime-flavored Jell-O to complement the add-ins that cooks across the country were combining in these aspics and salads. Popular Jell-O recipes often included ingredients like cabbage, celery, green peppers, and even cooked pasta. By the 1950s, salads would become so popular that Jell-O responded with savory and vegetable flavors such as celery, Italian, mixed vegetable, and seasoned tomato. These flavors have since been discontinued. In 1934, sponsorship from Jell-O made comedian Jack Benny the dessert's spokesperson. At this time Post introduced a jingle ("featured" by the agency Young & Rubicam) that would be familiar over several decades, in which the spelling "J-E-L-L-O" was (or could be) sung over a rising five-note musical theme. The jingle was written by Don Bestor, who was the bandleader for Jack Benny on his radio program. In 1936, chocolate returned to the Jell-O lineup, as an instant pudding made with milk. It proved enormously popular, and over time other pudding flavors were added such as vanilla, tapioca, coconut, pistachio, butterscotch, egg custard, flan, and rice pudding. The baby boom saw a significant increase in sales for Jell-O. Young mothers didn't have the supporting community structures of earlier generations, so marketers were quick to promote easy-to-prepare prepackaged foods. By this time, creating a Jell-O dessert required simply boiling water, combining the water with Jell-O, and putting the mixture into Tupperware molds and refrigerating it for a short time. New flavors were continually added and unsuccessful flavors were removed: in the 1950s and 1960s, apple, black cherry, black raspberry, grape, lemon-lime, mixed fruit, orange-banana, pineapple-grapefruit, blackberry, strawberry-banana, tropical fruit, and more intense "wild" versions of the venerable strawberry, raspberry, and cherry. In 1966, the Jell-O "No-Bake" dessert line was launched, which allowed a cheesecake to be made in 15 minutes. In 1969, Jell-O 1∗2∗3 (later Jell-O 1•2•3), a gelatin dessert that separated into three layers as it cooled, was unveiled. Until 1987, Jell-O 1•2•3 was readily found in grocery stores throughout most of the United States, but the dessert is now rare. In 1971 packaged prepared pudding called Jell-O Pudding Treats were introduced. Jell-O Whip 'n Chill, a mousse-style dessert, was introduced and widely promoted; it remains available in limited areas today. A similar dessert called Jell-O Soft Swirl was introduced in 1972, flavors included Chocolate Creme, Strawberry Creme, Vanilla Creme, and Peach Creme. Florence Henderson appeared in TV ads for this product. In 1964, the slogan "There's always room for Jell-O" was introduced, promoting the product as a "light dessert" that could easily be consumed even after a heavy meal. Throughout the 1960s through the 1980s, Jell-O's sales steadily decreased. Many Jell-O dishes, such as desserts and Jell-O salads, became special occasion foods rather than everyday items. Marketers blamed this decline on decreasing family sizes, a "fast-paced" lifestyle and women's increasing employment. By 1986, a market study concluded that mothers with young children rarely purchased Jell-O. To turn things around, Jell-O hired Dana Gioia to stop the decline. 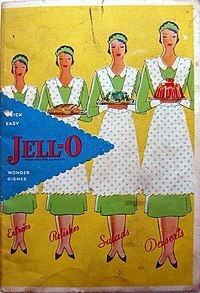 The marketing team revisited the Jell-O recipes published in past cookbooks and rediscovered Jigglers, although the original recipe did not use that name. Jigglers are Jell-O snacks molded into fun shapes and eaten as finger food. Jell-O launched a massive marketing campaign, notably featuring Bill Cosby as spokesman. The campaign was a huge success, causing a significant market gain. Cosby became the company's pudding spokesperson in 1974, and continued as the voice of Jell-O for almost thirty years. Over his tenure as the mouthpiece for the company, he would help introduce new products such as frozen Jell-O Pops (in gelatin and pudding varieties); the new Sugar-Free Jell-O, which replaced D-Zerta in 1984 and was sweetened with NutraSweet; Jell-O Jigglers concentrated gummi snacks; and Sparkling Jell-O, a carbonated version of the dessert touted as the "Champagne of Jell-O." In 2010, Cosby returned as Jell-O spokesperson in an on-line web series called "OBKB." In the 1980s, a Jell-O advertising campaign slogan reminded consumers, "Don't forget—you have to remember to make it." In 1990, General Foods was merged into Kraft Foods by parent company Philip Morris (now the Altria Group). New flavors were introduced: watermelon, blueberry, cranberry, margarita, and piña colada, among others. In 2001, the state Senate of Utah recognized Jell-O as a favorite snack food of Utah, recognizing the fundamental basis of Jell-O in Mormon cuisine such as Jell-O salad, and Governor Michael O. Leavitt declared an annual "Jell-O Week." During the 2002 Winter Olympics in Salt Lake City, the souvenir pins included one depicting green Jell-O. In the late 1980s and early 1990s, Jell-O's family-friendly reputation was slightly tarnished by Jell-O shots and Jell-O wrestling. As of 2011[update], there were over 420 million boxes of Jell-O gelatin and over 1 billion Jell-O cups sold in the United States each year. As of 2016[update], there were more than 110 products sold under the Jell-O brand name. Jell-O is used as a substantial ingredient in a well-known dessert, a "Jell-O mold" the preparation of which requires a mold designed to hold gelatin, and the depositing of small quantities of chopped fruit, nuts, and other ingredients before it hardens to its typical form. Fresh pineapple, papaya, kiwi, and ginger root cannot be used because they contain enzymes that prevent gelatin from "setting". In the case of pineapple juice and the enzyme bromelain that it contains though, the enzyme can be inactivated without denaturing through excessive heating and thus altering the flavor by the addition of a small measured amount of capsaicin sourced from hot chilies. 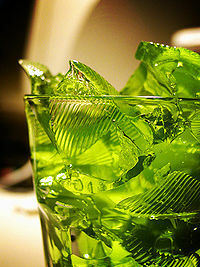 An alternative recipe calls for the addition of an alcoholic beverage to the mix, contributing approximately one third to one half of the liquid added after the gelatin has dissolved in a boil. A serving of the resulting mixture is called a "Jell-O shot" at parties. The quantity and timing of the addition of the alcohol are vital aspects; it is not possible to make Jell-O shots with alcohol alone, as the colloidal proteins in dry gelatin consist of chains which require a hot liquid to denature them before they can then reform as a semisolid colloidal suspension. Pure alcohol cannot be heated sufficiently to break down these proteins, as it evaporates. Vodka or rum is commonly used in Jell-O shots, but the shots can be made with almost any alcohol. It is important to adjust the proportions of alcohol and cold water to ensure that the mixture sets when experimenting with different types of alcohol. The Jell-O shots can be served in shot glasses and/or small paper or plastic cups; the paper or plastic cups are easier to eat from, but shot glasses are more attractive. The alcohol in Jell-O shots is contained within the Jell-O, so the body absorbs it more slowly, causing people to underestimate how much alcohol they have consumed. Drinkers must monitor their intake because of this. American singer-songwriter Tom Lehrer claims to have invented the Jell-O shot in the 1950s to circumvent restrictions on alcoholic beverages at the army base where he was stationed. An early published recipe for an alcoholic gelatin drink dates from 1862, found in How to Mix Drinks, or The Bon Vivant's Companion by Jerry Thomas: his recipe for "Punch Jelly" calls for the addition of isinglass or other gelatin to a punch made from cognac, rum, and lemon juice. Thomas warns that strength of the punch is "artfully concealed" by the gelatin. As of 2012[update], LeRoy, New York, is known as the home of Jell-O and has the only Jell-O Museum in the world, located on the main road through the small town. Jell-O was manufactured here until General Foods closed the plant in 1964 and relocated manufacturing to Dover, Delaware. The Jell-O Gallery museum is operated by the Le Roy Historical Society at the Le Roy House and Union Free School, listed on the National Register of Historic Places in 1997. At the museum, visitors can learn about the history of the dessert from its inception. Visitors starting on East Main Street, follow Jell-O Brick Road, whose stones are inscribed with the names of former factory employees. The museum offers looks at starting materials for Jell-O, such as sturgeon bladder and calves' hooves, and various molds. The Jell-O plant in Mason City, Iowa, produces America's supply of ready to eat Jell-O gelatin dessert and pudding cups. Jack Benny's top-rated radio show did not break for commercials. Instead, announcer Don Wilson incorporated speeches about Jell-O into the program at appropriate places, to Jack's feigned comic annoyance. Lucille Ball's My Favorite Husband, the radio predecessor to TV's I Love Lucy, was another popular program sponsored by Jell-O for much of its 124-episode run. Ball's character Liz Cooper often opened the program with the lively greeting "jell-o everybody!" Comedian Bill Cosby is associated with Jell-O and, more famously, Jell-O pudding, and he appeared in many commercials promoting both. Shows like Mad TV, The Simpsons and Saturday Night Live parody Cosby, using Jell-O references like "pudding pop". In the 1960s, the cast of the sitcom Hogan's Heroes did a commercial with Carol Channing featuring Colonel Hogan, his men, Kommandant Klink and Sergeant Shultz having Jell-O and Dream Whip for dessert. Also, in the first few seasons of the first of Lucille Ball's two 1960s television series, The Lucy Show, cast members including Vivian Vance often did commercials for Jell-O. In 1995, Jell-O carried the tagline "It's alive!" and had the phrase "J-E-L-L-OOOOOOO!". In August 2018, Jell-O released an animated series on YouTube and Amazon Prime Video titled "JELL-O Wobz" in partnership with DreamWorksTV. Jell-O is mentioned in the 1936 popular song "A Fine Romance" by Dorothy Fields (with music by Jerome Kern), where it is humorously referred to as a mundane alternative to the excitement of romantic love. In 1980, the American composer William Bolcom wrote a popular humorous song about Jell-O, "Lime Jello Marshmallow Cottage Cheese Surprise", satirising its use in combined sweet and savory dishes such as Jello salad. In 1992, Ivette Bassa won the second ever Ig Nobel Prize in chemistry for inventing blue Jell-O. Jell-O is especially popular among members of The Church of Jesus Christ of Latter-day Saints (LDS Church), often referred to as "Mormons". The Mormon Corridor region, which has the highest Mormon populations, was nicknamed the "Jell-O Belt", referring to the 20th-century Mormon cultural stereotype that Mormons have an affinity for Jell-O. In support of this image, Jell-O was designated as Utah's official state snack food in 2001. When drafting the resolution, the Utah Legislature gave many reasons to recognize Jell-O, including that Utah had had the highest per-capita consumption of Jell-O for many years, and how citizens of Utah had rallied to "Take Back the Title" after Des Moines, Iowa exceeded Utah in Jell-O consumption in 1999. The culture of Utah, petitions by Utahns, and campaigning by students of Brigham Young University were also mentioned as reasons for recognizing Jell-O. Bill Cosby, longtime spokesperson for the Jell-O brand, appeared before the Utah Legislature in support of the bill. "He told the assembly that he believes the reason people in Utah love Jell-O is that the snack is perfect for families -- and the people of Utah are all about family." The 2002 LDS Cinema romantic comedy The Singles Ward, which is filled with inside Mormon jokes and stereotypes, has a scene where someone slips and falls in Jell-O at a church social for young, single Mormons. The stereotype of Mormons loving Jell-O does not appear to have a long history. Media reports in 1969 and 1988 on foods popular among Mormons or in Utah make no mention of Jell-O, and a 1988 article mentions Jell-O as a Lutheran tradition. In 1997, Kraft released sales figures revealing Salt Lake City to have the highest per-capita Jell-O consumption. ^a Also available in a sugar free/low calorie product. ^c Only available as a prepared product. ^ Purdom, Candace (April 10, 2001). "Program on History of Gelatin Breaks the Mold: Shedding Light on Familiar Dessert". Chicago Tribune. Retrieved 20 June 2013. ^ "Improvement in the Preparation of ..." Google Patent Search. ^ a b Belson, Ken (May 4, 2008). "Upstate, Where It Was First Made, Unwavering Devotion to Jell-O". The New York Times. Retrieved July 15, 2012. ^ "History of Jello". The Jell-O Gallery. Le Roy Historical Society. 27 October 2011. Archived from the original on 13 February 2014. ^ "Orator Francis Woodward". findagrave.com. Retrieved April 21, 2016. ^ Wyman, Carolyn (2001). Jell-O: A Biography — The History and Mystery of America's Most Famous Dessert. Mariner Books. pp. 4–5. ISBN 978-0156011235. ^ a b c d e f Christy Spackman (August 17, 2012). "Mormonism's Jell-O Mold". Slate.com. Retrieved August 17, 2012. ^ a b c d "The New JELL-O Book of Surprises". Chemical Heritage Foundation. Archived from the original on April 13, 2016. ^ "The Jell-O Museum and Gallery". Archived from the original on 29 February 2008. Retrieved 12 August 2015. ^ "A timeline set in Jell-O". Deseret News (Salt Lake City). June 28, 2006. Retrieved July 15, 2012. ^ "Jello Again". Variety. December 11, 1940. p. 35. Retrieved 18 November 2015. ^ Frederix, Emily (May 16, 2010). "Bill Cosby & Jell-O: Together Again". Huffington Post. Archived from the original on May 20, 2010. ^ Kay, Katty (February 6, 2001). "Utah loves Jell-O". Washington: BBC News. Retrieved 12 August 2015. ^ Phillips, Valerie (February 6, 2002). "There's green Jell-O on your lapel... Abundance of food pins are unique to Salt Lake Olympics". Deseret News. Retrieved April 21, 2016. ^ "Wiggle Room". Sunday Morning. CBS. 27 November 2011. Retrieved 1 August 2016. ^ Jell-O Products. Kraft. Retrieved 4 August 2016. ^ Pineapple Jelly.MPG. YouTube. 23 March 2010. Retrieved 12 August 2015. ^ Sampson, Susan (September 9, 2006). "Jell-O shots pack a bang". The Toronto Star. Toronto, Ontario, Canada. p. M.4. Retrieved August 3, 2010. A Jell-O shot is a cocktail you can eat. ^ a b My Science Project – What is the Ultimate Jell-O Shot?. ^ "That Was the Wit That Was". SF Weekly. April 19, 2000. ^ a b Thomas, Jerry. "How to Mix Drinks, Or, The Bon-vivant's Companion". google.com. ^ "Jell-O teams with DreamworksTV on animated series for YouTube, Amazon Prime Video". Marketing Dive. Retrieved 2018-08-06. ^ Furia, Philip; Patterson, Laurie (2010). The Songs of Hollywood. Oxford University Press. p. 98. ISBN 9780199792665. Retrieved 16 February 2018. ^ Bolcom, William; Morris, Joan (1980). "Lime jello marshmallow cottage cheese surprise". Melville, N.Y. : E.B. Marks Music Corp. Retrieved 16 February 2018. ^ Forstie, Clare (2012). "From Rosy to Regrettable: Mixed Nostalgia and the Meanings of Jell-O Salad". Digest: A Journal of Foodways and Culture. American Folklore Society. Archived from the original on 16 February 2018. Retrieved 16 February 2018. ^ Eric Richard (1992-10-06). "Second Ig Nobel Ceremony Held". The Tech. ^ Jonathan N. Axelrod (1995-09-25). "Ig Nobel Tickets Go on Sale:Awards Ceremony Set to Honor Unusual Achievements". Harvard Crimson. ^ Crump, Steve (21 March 2004). "Don't ask me. Getting jiggly outside the Jell-O Belt". The Twin Falls Idaho Times-News. p. B01. ^ Mikita, Carole (17 November 2003). "Mormon Moviemakers: The Sequel". KSL-TV. Reprinted at ldsfilm.com entry for Saints and Soldiers. ^ Editorial board (1 February 2001). "Does Jell-O belong at Legislature". Provo Daily Herald. ^ Katty, Katty (6 February 2001). "Utah loves Jell-O - official". BBC. ^ a b c "Utah Legislature SR0005". Retrieved 12 August 2015. ^ Merritt, Brett (16 October 2003). "The pudding Papa: Jell-O pitchman Bill Cosby jiggles onto the stage at Abravanel Hall". Provo Daily Herald. ^ "JELL-O". Recipes. Retrieved 12 August 2015. Wikimedia Commons has media related to Jell-O.